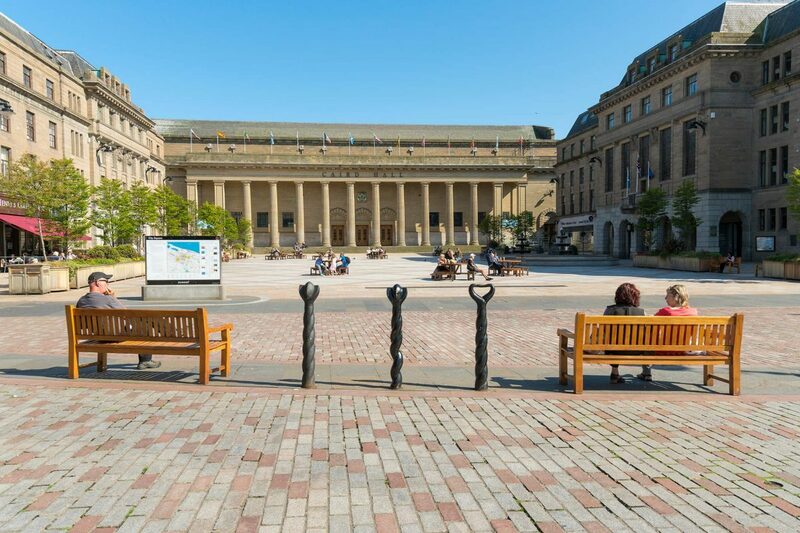 A Day Out to Dundee should be on everyones bucket list. Dundee is remembered for Jute Jam and Journalism however recently the city has been in the news for something completely different. September 2018 it became the home of the first branch of the Victoria & Albert Museum and the only V&A Museum outside London. The building designed by the Japanese architect Kengo Kuma is built in the shape of a cliff. The architect took his inspiration from the cliffs on Scotland’s north east coast. 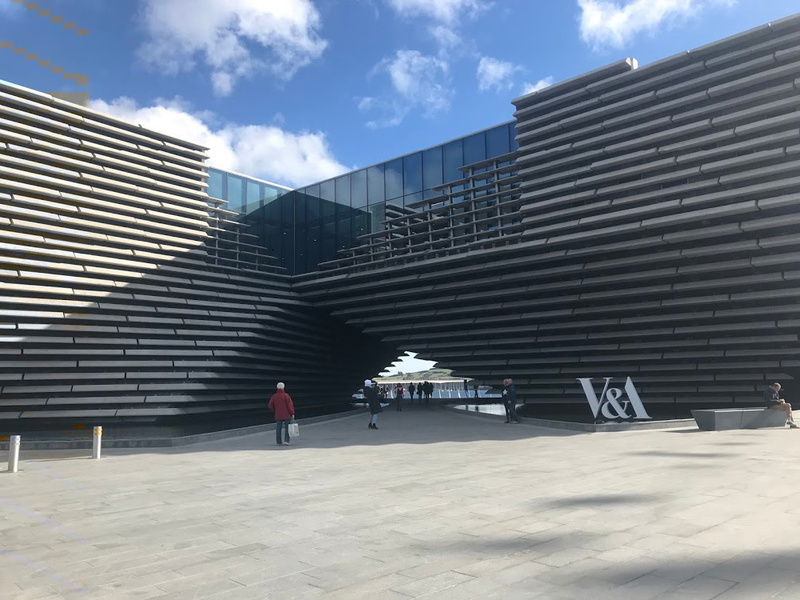 There are two other attractions I would recommend on a day out to Dundee which are very close by. The RRS Discovery (next to the V&A) and for primary school age children Dundee Science Centre is only a short walk away. A Day Out to Dundee from Crail is a forty five minute drive. Firstly take the A917 to St Andrews. When reaching the main street (South Street) at the top of Abbey Walk take a right at the roundabout and follow the road past the cathedral on your right into North Street. Then drive west, following the signs for the A91 and out of St Andrews. At the roundabout in Guardbridge take the A919 and follow the signs for the Tay Road Bridge and Dundee. Once over the bridge take a left turn. The V&A and RRS Discovery are on your left. There is a small car park at the V&A however this gets filled up quickly. There is also a multi storey car park a short distance away next to the railway station and Dundee Science Centre. 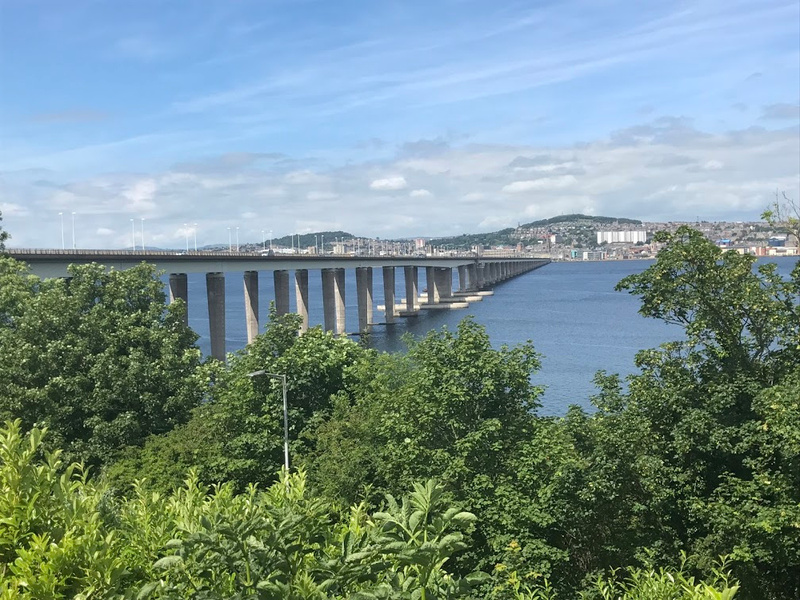 Before driving on to the bridge you may want to take a detour to the right into the car park and admire the view across the Tay towards Dundee. 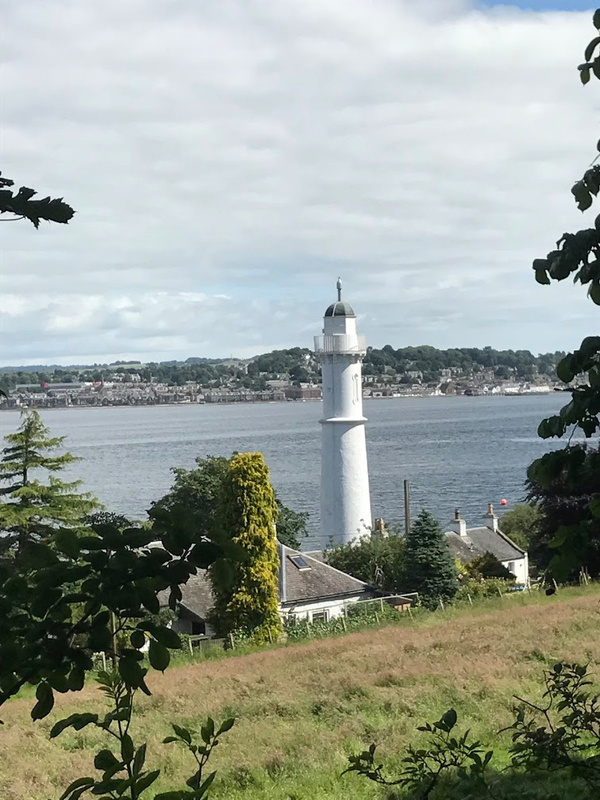 On your return journey from your day out to Dundee you may want to take a left at the round about and drive along the road towards Tayport for more views across the Tay towards Dundee and Broughty Ferry. From Crail take the Stagecoach 95 to St Andrews Bus Station. Then take the 99 to Dundee. Buses run every 15 mins from St Andrews to Dundee. 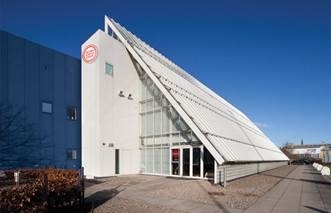 The museum has been built out into the waters of the River Tay, the front resembling the bow of a ship. As you drive across the Tay Road Bridge the building is quite striking and catches your eye almost immediately. Once you are inside it has a different effect like nothing I have ever experienced before and certainly memorable. 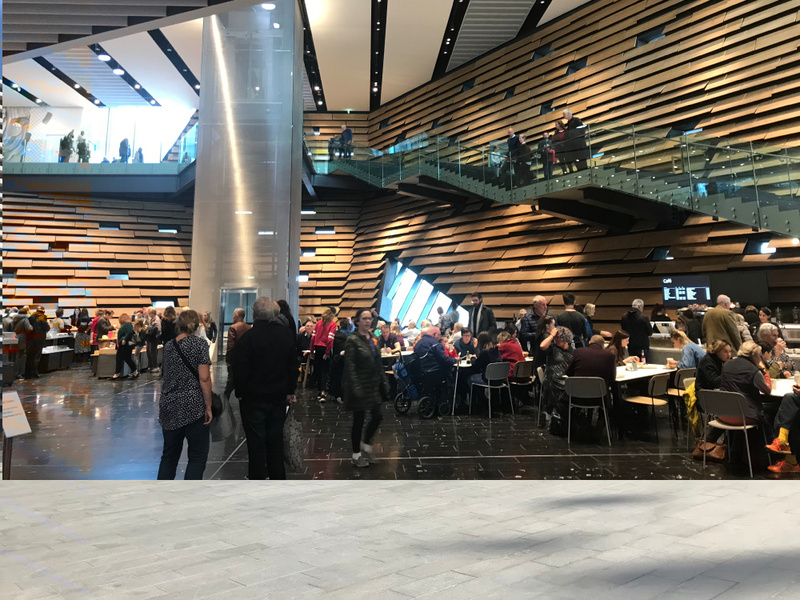 The floor area is 8000 square metres and includes a main hall, learning centre, auditorium, temporary exhibition space for visiting exhibitions and a permanent Scottish Design Gallery. The temporary exhibition space is the largest of any museum in Scotland. On the upper floor there is an excellent restaurant which booking is essential for lunch. There is also an outdoor terrace with views over the River Tay. On the ground floor there is a cafe serving coffee’s teas and light snacks. Children are welcome in both the cafe and the restaurant which both offer a children’s menu. At weekends and school holidays visitors can eat packed lunches in the picnic room. There is also a buggy park on the ground floor. Admission to the museum is free however a charge will be made for touring exhibitions. For a full list of What’s On and charges click this link. Museum opening hours are 10.00 – 17.00 daily. RRS Discovery was the ship used to take Captain Robert Falcon Scott and his team on their first expedition to Antarctica in 1901. The expedition was the brainchild of Sir Clements Markham President of the Royal Geographical Society who raised the necessary funds for the construciton of the ship and the scientific expedition in 1900. Dundee was a major whaling centre and Dundee’s shipyards had the expertise to construct ships robust enough to travel through pack ice. The ship set sail from Cowes in the Isle of Wight in the summer of 1901 bound for New Zealand. The voyage took five months arriving in Antarctica on the 8th of January 1902.The purpose of the expedition was to make magnetic surveys and carry out meteorological, oceanographic, geological and biological research. The work was truly groundbreaking with over five hundred new kinds of marine animals, spiders, shrimps, star and shellfish discovered. The expedition was the first to sight an Emperor Penguin rookery and obtain an egg. On November 2nd 1902 Scott together with two senior officers Ernest Shackleton and Edward Wilson set out to cross the Great Ice Barrier towards the South Pole. They reached latitude 82′ 17′ by December 30th however reluctantly turned back due to Shackleton’s ill health. They arrived back at Discovery on February 3rd 1903 having covered 950 miles. Discovery was stuck in pack ice and had to be freed by a controlled explosion. The ship returned to Britain in September 1904. After the expedition the ship was owned by the Hudson Bay Company. It was also involved in running munitions to Russia during the First World War. She made two further voyages to Antarctica before being laid up in London. In 1986 she was brought back to Dundee to become part of the Discovery Point Visitor Centre on Dundee’s Waterfront. If you want to learn more about the ship, opening times and admission prices then click on this link. 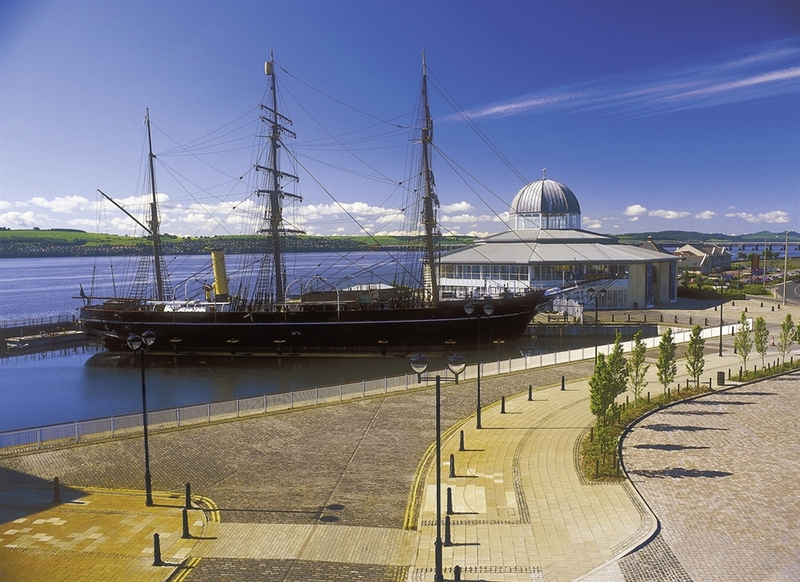 Dundee Science Centre is only a short walk from the V&A and Discovery Point. The centre is packed with interactive scientific exhibits designed to help children learn science in a fun interactive way. Exhibits range from the human body, medical research, design and build and robotics. The centre probably best appeals to primary school age children from the ages or 6-12. However participation from mums and dads is encouraged. For more details on what there is to see and do click this link. It is certainly a good family fun day out and an ideal place to spend a cold wet day. Some may feel that a day trip to Dundee would not be complete without spending at least some time shopping. 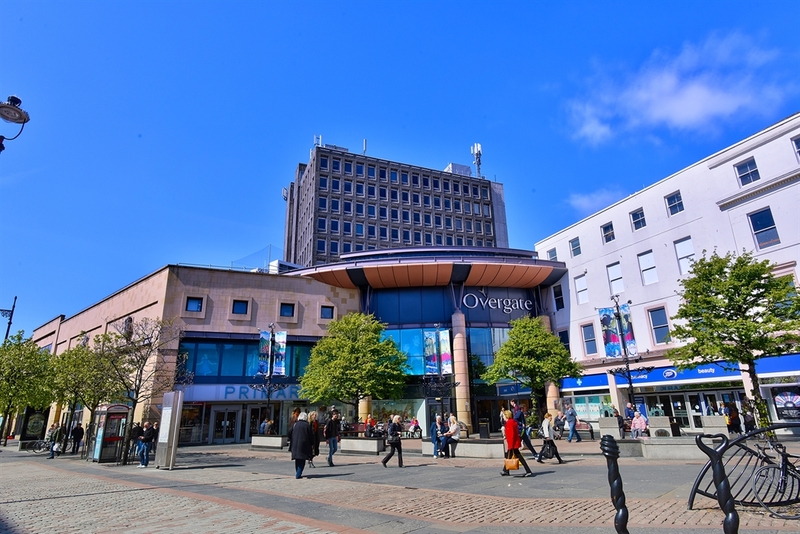 The Overgate Centre is only a short walk from the waterfront. The centre is covered throughout and has one large department store Debenham’s together with Primark and all the major chains you will find in most UK city centres. The centre is also packed with cafe’s and restaurants with something for everyone. 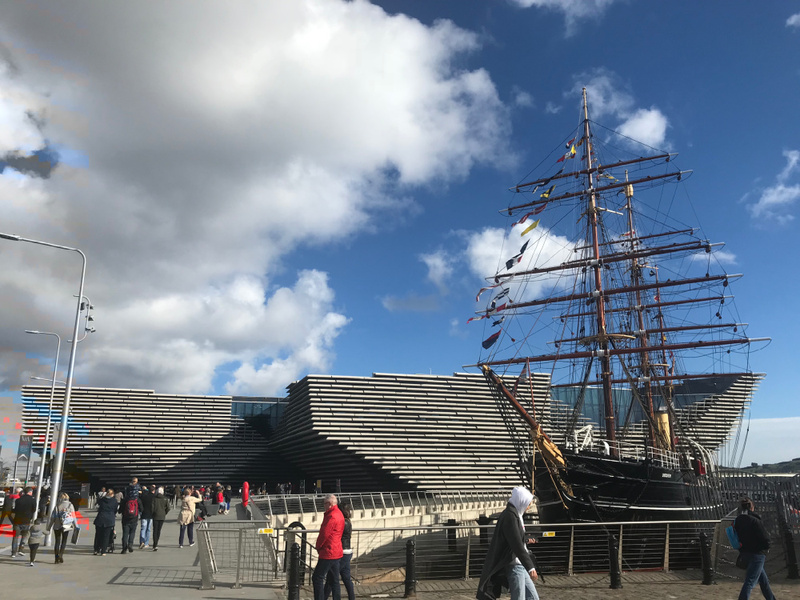 I do hope that you will enjoy your day out to Dundee and visit some of the attractions I have outlined in this blog. If you would like more information on weekly, midweek or weekend breaks at Sandcastle Cottage then please do not hesitate to contact me. You will find more details on prices and availability by clicking this link or the book now button below.